Walter De Gregorio, FIFA's director of comms and public affairs, downplayed the arrest of FIFA officials and corporate executives during an emergency press conference today. The Swiss authorities and the US Department of Justice are investigating corruption relating to lucrative media and marketing rights of football tournaments. Four of the 14 people indicted are sports marketing executives. Meanwhile, problems could deepen for FIFA as the Swiss Attorney General announced it would launch a separate investigation into the allocation of the FIFA World Cup to Russia (2018) and Qatar (2022). During the press conference, announced this morning, De Gregorio denied that FIFA was in crisis. He claimed the governing body had initiated the investigation when it went to the Swiss Attorney General in November 2014. "It’s a surprise that [the arrests] happened today but it’s not a surprise that it happened, " he claimed. 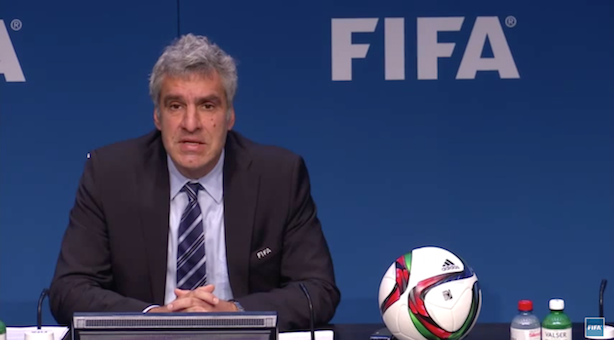 "It’s a hard time – not nice to be here… At the same this is good for FIFA, this is good. It confirms we are on the right track. It hurts, it’s not easy, but it’s the only way to go and we are ready to go the way we started four years ago and nothing will stop us. "In this case, FIFA is the damaged party and this leads to the fact that there were no searches in the offices of FIFA." - FIFA general secretary Jérôme Valcke and president Sepp Blatter were "not involved" in the procedure. - No suspensions would be made at FIFA at this time. - The FIFA presidential election will take place as scheduled and will not be postponed. - The Garcia Report, which was commissioned by FIFA to look into the allegations of corruption in world football, "will be published" for the general public. However, no time frame was given. - Russia and Qatar will remain as the hosts for the 2018 and 2022 World Cup, respectively. In a comprehensive statement, the US Department of Justice claimed there has been a 24-year corruption scheme in place at FIFA. Aaron Davidson: President of Traffic Sports USA. Hugo and Mariano Jinkis: Controlling principals of Full Play Group, a sports marketing business based in Argentina, and its affiliates.